Familiar local faces: From left, Bunnings team members Rachael McGregor, Malcolm Vivian, Pascale Farrow, Warwick Complex manager Dan Pfingst, Kerri Nicholls and Alan Gersbach. Warwick residents are invited to join local Bunnings team members in celebrating the Grand Opening of the new Bunnings Warehouse this Friday 23 November from 5pm. The store opened to the public last Sunday 18 November. To celebrate the Grand Opening tomorrow night there will be a spectacular fireworks display at 8pm alongside family-friendly activities such as face-painting, a petting zoo, jumping castle, fairy floss and popcorn. Warwick residents will also receive a visit from some of the cute and cuddly characters from Paw Patrol. 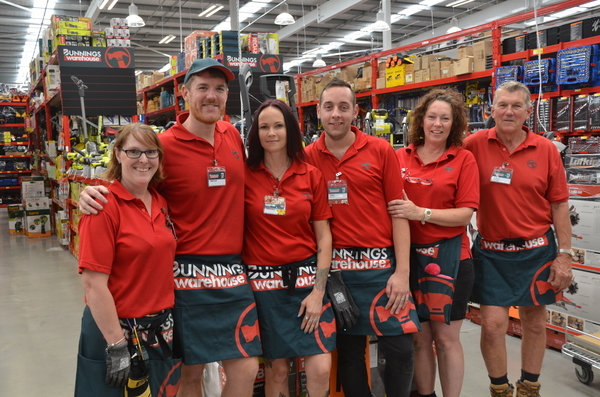 Complex Manager Dan Pfingst said the team at Bunnings Warehouse Warwick is excited to welcome the local community to the store and celebrate with them during the Grand Opening weekends. “Our team members have worked extremely hard to prepare the store for opening and are looking forward to helping customers with their home improvement projects, as well as providing free D.I.Y. Workshops for adults and kids,” Dan said. The Grand Opening weekend festivities will continue in the last weekend of November and the first weekend of December, with a range of fun-filled activities for the whole family on offer. • Opening hours – Monday to Friday, 6.30am to 9pm; Saturday and Sunday, 7am to 6pm. • From 5pm: Face-painting, petting zoo, jumping castle, fairy floss and popcorn.